← 20 Reasons Why Modi is Divisive. In the summer of 1989, with few childhood friends, I was camping in a jungle near Bhopal. We were lying on cots under a peepal tree, looking at the skies, fighting last night’s hangover. Few birds were flying. My friend, Pawan, like Bond, took out his air gun and shot a bird. Excited with adventurism, we all tried our hands at shooting birds but to no success. Later, in the evening, over river-chilled beers I asked him why is it that when my aim is correct, always the ‘bull’s-eye’ aim, I never get the shot right whereas he gets the bird in an instant. He told me the secret “Your problem is you are always aiming at the bird.” “Where else you do you aim?” I asked. “If you really want to shoot the bird, never aim at the bird where it is. You aim at where it’s going to be.” He replied with ease. That’s the difference between a seasoned and amateur politician. That’s the difference between Modi and rest of Indian politicians. A little understanding of the backdrop is required. In a country which is still at the ‘basic needs’ stage, if you go by Maslow’s pyramid of hierarchy, everything eventually sums up to money. People need to survive. To survive they need money. People take it for granted that Government always has money. That conditioning was formed during Congress rule of doles. Freebies. Subsidies. And why not? When you see Government involved everywhere controlling economy in all available measures. No schools, government comes in. No hospitals, Government comes in. No factories, Government comes in. You name it. Airports, ports, airlines, railways, roads, bridges, dams, big industry, health, education… you name it and you’ll find that the Government is everywhere and not only that it has major share in most. But, in reality, Government doesn’t have 3Ms. Money. Management. Motivation. So everything that is Government controlled is inefficient, hence corrupt. People who run Government like Ministers, legislators, administrators, clerks and even peons work with an attitude that nothing is going to change then why work hard. Since everyone is corrupt so there is no harm in being part of the corrupt system. Politics meant power which meant real estate, investment and black money. And of course misuse of power by being dynastic, partisan and divisive. It was Congress which divided the country. Once in 1947 and then in all those 60 years of its rule. Since Sonia Gandhi came to indirect power she took the sycophancy and divisiveness to such an extent where Hindus were made to feel like culprits and Muslims like victims. This conspiracy led to an angst of unprecedented proportions amongst young, aware and raring-to-go voters. It was the youth who felt they were not heard by its dinosaur-like government. And then one fine morning they took on to social media. This new India started outraging on social platforms, especially twitter, blogging and Youtube. With Whatsapp they all got connected and information, feelings, opinions etc started flowing into each other, creating a web of pro-India and anti congress. 2G, CWG, Adarsh, Coalgate, railgate and many other scams united their voice. Anna’s movement and Nirbhaya case made them realise that actually Congress is a non-Government. It’s anti-people. A quick diagnosis of what she is actually saying: That all Muslims are one bloc not capable of discretion. And that only Muslims are secular and that all Hindus are not ‘Secular’. 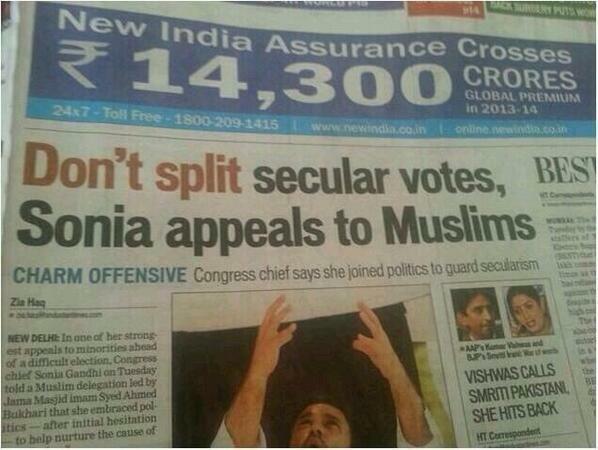 What she means is that Muslims must not vote for Modi. She doesn’t want Muslims to taste success. That’s exactly what Modi is fighting. He is urging Muslims and Hindus to fight poverty – together. United. Now, coming back to my friend’s ‘How to shoot a flying bird’ theory, you can see that Modi, like a clever and seasoned politician knew where the country was ‘going to be’ in 2014. He knew that jobless youth, inflation affected households, secularism-attacked Hindus, poor Muslims, victimized women and the real Aam Admi ( not the breakaway group of rich and morally corrupt liberals flocking Kejriwal’s AAP) will vote for only one thing : financial empowerment. So, slowly but very meticulously, using best of IT and management brains, unfiltered raw data generated from primary contacts with real Aam Admi, he built a campaign which nobody, specially Congress, didn’t care about. Nobody (including BJP folks like Advani, Swaraj, Jaswant etc.) in political circles and fake liberals’ circuit could even in their wildest dreams had thought that election can be fought on issues of Development. An election minus ‘Sickular’ plank? Nobody could ever dream that. Do some research and you will find that all post-Indira Gandhi leaders have built their careers only on religious/caste based politics. On fake secularism ( I believe ‘Secular’ is world’s most useless word). Now, they know that they are missing the target. They also know that in all likelihood Modi is going to hit the target. Because In Election 2014, all these morally and intellectually bankrupt politicians are shooting at where the bird ‘is’. Even the new kid on the block, who fake liberals, corrupt NGO’s, stagnant corporate honchos, useless politicians, irrelevant NRIs and unpatronised local lumpens support unconditionally, is also found shooting in the dark. Sometimes at corruption. Next day, wearing a skull cap, at communalism. Then at Ambani. Then at Media. It happens. Specially when you have serious Gas problems. ( AAPians, please, that was a joke). So now they have all come united, including corruption messiah Kejriwal. They have come united in their failure to spot the bird. Now, in one voice they are telling the bird that its at wrong place and must come back to a place where they can hit the bird – Sickularism. After personal failure in 2002, Modi realised that communal issues will eventually fail. he prepared himself for success. He brought development to riot victim’s doorsteps. No amount of anti-development campaigns against him and Gujarat, no amount of spot-checks by Kejriwal, no amount of data machinery of UPA are going to change people’s perceptions about Gujarat. He could foresee that an aware Indian youth doesn’t want to migrate to USA like the youth of 70’s and 80’s. This youth wants to see India as Asian tiger. So, he created a mini-success story in Gujarat and now he roars about that model which best of brains in India and abroad have failed to demolish. Traditional parties have been running their campaigns calling him fascist, majoritarian and authoritative. What they don’t understand that authoritarianism is not something Indians don’t like. Incompetence (Kejriwal) and indecisiveness (MMS) is what they don’t like. Look at the list of most admired and followed leaders of India: Bose, Patel, Nehru, Indira, Mamata, Jaya, MGR. All authoritarian. Modi could see that. People who know him very well tell me that he is most democratic administrator who takes advise and suggestions from everyone. But he presents a very carefully ‘airbrushed’ persona of ‘I-mean-business’ kind of leader. In 2002 he could see that and built an image which is a modern version of Patel. Indians believe that they failed in 1947 with Patel, this time they want to succeed. Liberals and moderates stuck in time-warped theories of a Nehruvian and socialist India must realise that these elections are not about 2002. Or Secularism. Or morality. Or ethics. It is about money. Its about financial empowerment. Its about success. Indians don’t want to be stuck with losers and excuses anymore. After the failure of 2002, Modi understood that to succeed he will have to target where the bird is ‘going to be’. For now, it seems, he is hitting bull’s-eye. This entry was posted in Modi, Politics and tagged Congress, gandhi, India, Kejriwal, Modi, politics, rahul. Bookmark the permalink. 4 Responses to What is causing Modi wave? Speechless..!! Now i understand that you are not Supporting Namo blindly.. there is a Logic. and that logic matters a lot. I think thats exactly why, even with some his flaws, India needs Modi now. His validity may last only for next 10-15 years, but atleast he will be able to start a self-sustainable growth engine which not only is financially empowering but also instill the feeling of pride in Indian and Indianness.